Loppon Sonam Tsemo, second of the five founders of the Sakya Order was born in the Male Water Dog year (1142) in Sakya, Tibet. He was the eldest of the three sons born to Sachen Kunga Nyingpo, the first founder of the Sakya Order. His mother’s name was Machig Odron. His younger brother was Jetsun Dragpa Gyaltsen, who became the third founder of the Sakya Order. It is said that when Loppon Sonam Tsemo was born, words written by dakinis appeared above the doorway to the great stupa in Bodhgaya, India where Lord Buddha Shakyamuni attained enlightenment. 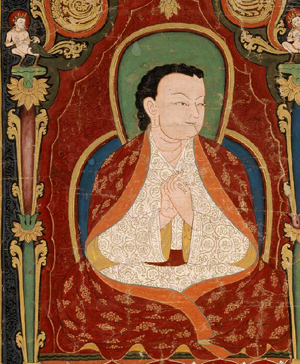 The words proclaimed, “The holy abbot Sonam Tsemo, emanation of Manjushri and owner of all Vajrayana Dharma, has taken birth in Sakya.” Immediately after taking birth, Sonam Tsemo amazed everyone in the birth chamber by saying in Sanskrit, “I am beyond childish behavior” and sitting up in full meditation posture. When he was three years old, he directly perceived the Bodhisattva Manjushri and the deities Shri Hevajra, Green Tara, and Arya Acala. He also taught from memory the three Hevajra tantras, the Chakrasamvara Root Tantra and the Samucca Tantra and was able to describe memories of eleven previous lives. During his youth, Sonam Tsemo received many important teachings on Vajrayana Dharma from his father. He studied them deeply and learned them thoroughly. Before he was seventeen years old, he could recite forty different tantras from memory and his fame as the most learned scholar of the Vajrayana was proclaimed as far as the Ganges River in India. At the age of seventeen, he told his brother Jetsun Dragpa Gyaltsen who was thirteen at the time, “I will go to central Tibet to study the sutras and the field of logic. You should remain here at this holy seat of Sakya Monastery to lead the disciples.” Thus transferring his authority to his brother, he left for Sangphu Neuthok Monastery. At Sangphu Neuthok, the great master Chapa Chogyi Sengge had eight excellent disciples who were known as the eight great lions. He had eight other disciples who were known as semi-lions. He had four disciples from noble families: Loppon Sonam Tsemo himself from the Khon family; Netso from the Khu family; Ramo from the Ngok family; and Oma from the Nyo family. Loppon Sonam Tsemo became the most outstanding and learned among all of the disciples. When Loppon Sonam Tsemo was 26 years old, he composed the treatise Door to the Dharma at the holy shrine of Nalatse. This great work provides a flawless outline of the complete Buddhist doctrine and teachings. During this period, both day and night, he received immeasurable teachings directly from Mahasiddha Virupa and many other tutelary deities. Thus he overcame all doubt concerning every aspect of the Dharma and attained perfect memory of all knowledge. By the age of 27 he was widely renowned as the central pillar of the Buddhist doctrine in the world. The next year, at the age of 28, Loppon Sonam Tsemo bestowed the Lam Dre teaching in the ancient shrine of Sakya Monastery. On the first day of the month, while explaining the profound view of the nature of phenomena, the gathering of disciples perceived him in transformed aspect. Jetsun Dragpa Gyaltsen saw him as the Bodhisattva Manjushri seated amidst an ocean of offerings. Chosay Chagkyi Dorje saw him as Mahasiddha Virupa, the founder of the Lam Dre teaching. Nyak and Mokton Tsuktor Wangpo and the rest of the assembly saw him as the Bodhisattva Avalokiteshvara. After these visions all of the disciples gained a special experience of meditative concentration. During the empowerment, Jetsun Dragpa Gyaltsen perceived boundless light rays emanating from his guru Loppon Sonam Tsemo and heard the music of countless celestial instruments. Loppon Sonam Tsemo demonstrated an actual emanation mandala and bestowed empowerment upon Jetsun Dragpa Gyaltsen within it. Thus revealing the profundity of the mandala, he opened the door to inconceivable meditative concentration for his disciples. 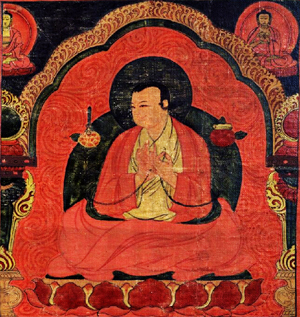 Loppon Sonam Tsemo skillfully taught both the sutra and tantra according to the needs of each disciple. He was a great scholar of both the Pramanavirtika and the Excellent Dharma. He wore a yellow Dharma robe, symbolizing that he was unsurpassed in explanation and debate on both scriptural and philosophical topics. Loppon Sonam Tsemo authored many, many texts, which are like a garland of elegant sayings, including: Schematization of the Tantra; Rays of Sunlight: An Explanation of the Last Two Chapters of the Hevajra Root Tantra; Commentary on the Second Chapter of the Samputa Tantra; Door to the Dharma; Easy Entrance for Beginners; and Instructions for Reading Sanskrit. 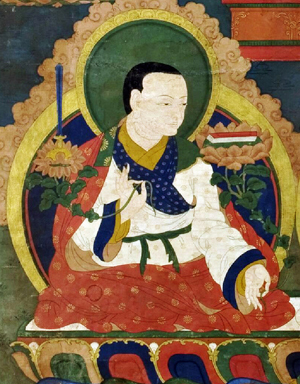 Loppon Sonam Tsemo held the throne of Sakya for three years. Then he relinquished authority to his younger brother and spent the rest of his life in study and meditation in quiet and isolated places. Crowning his extensive great knowledge of sutra and tantra with long periods of intensive meditation, he attained the highest stage of realization. Thus it is written. In the perception of pure beings there is no doubt that Loppon Sonam Tsemo departed for Sukhavati without leaving his body. For the benefit of common beings he manifested parinirvana without abandoning his body and traveled unhindered to the realm of Sukhavati.